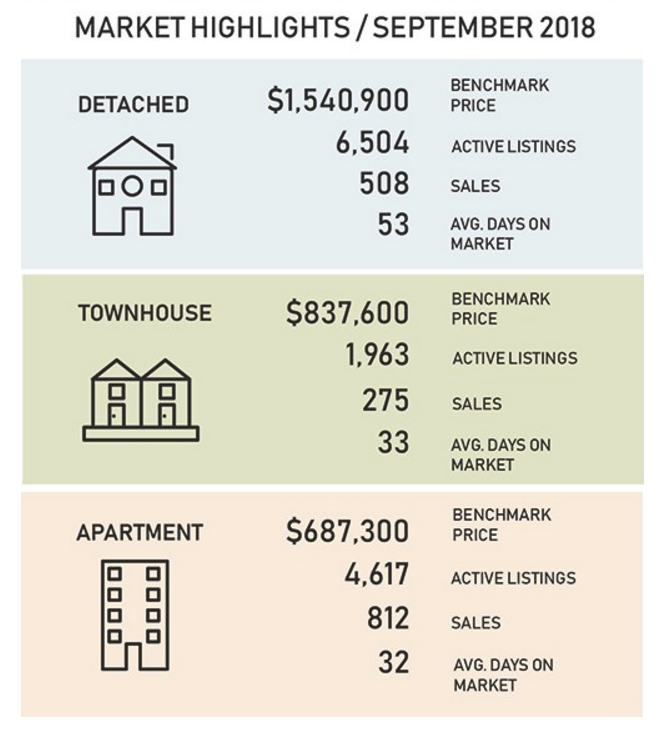 There were 5,279 detached, attached and apartment properties newly listed for sale on the Multiple Listing Service® (MLS®) in Metro Vancouver in September 2018. This represents a 1.8 per cent decrease compared to the 5,375 homes listed in September 2017 and a 36 per cent increase compared to August 2018 when 3,881 homes were listed. The total number of properties currently listed for sale on the MLS® system in Metro Vancouver is 13,084, a 38.2 per cent increase compared to September 2017 (9,466) and a 10.7 per cent increase compared to August 2018 (11,824). For all property types, the sales-to-active listings ratio for September 2018 is 12.2 per cent. By property type, the ratio is 7.8 per cent for detached homes, 14 per cent for townhomes, and 17.6 per cent for condominiums. The MLS® Home Price Index composite benchmark price for all residential properties in Metro Vancouver is currently $1,070,600. This represents a 2.2 per cent increase over September 2017 and a 3.1 per cent decrease over the last three months. Sales of detached properties in September 2018 reached 508, a 40.4 per cent decrease from the 852 detached sales recorded in September 2017. The benchmark price for detached properties is $1,540,900. This represents a 4.5 per cent decrease from September 2017 and a 3.4 per cent decrease over the last three months. Sales of apartment properties reached 812 in September 2018, a 44 per cent decrease compared to the 1,451 sales in September 2017. The benchmark price of an apartment property is $687,300. This represents a 7.4 per cent increase from September 2017 and a 3.1 per cent decrease over the last three months. Attached property sales in September 2018 totalled 275, a 46.9 per cent decrease compared to the 518 sales in September 2017. The benchmark price of an attached unit is $837,600. This represents a 6.4 per cent increase from September 2017 and a two per cent decrease over the last three months.